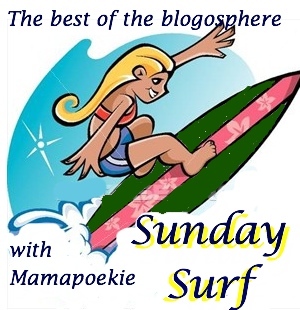 Hobo Mama: Sunday Surf: Happy third blogiversary to me! Arrr…we be hoboes here. And pirates. Maybe hobo pirates. Yesterday, September 11, was my three-year blogiversary. I have never celebrated my blogiversary before and was curious when it was. I knew it was September, but when exactly? When I saw what the starting date was … well, seriously, could I not have chosen to start it a day before or after? But, stupid choice of date aside, it's fun to think about what's transpired in the past three years. I started Hobo Mama when Mikko was three months old, which is surprising to me in retrospect. First of all, how did I find the energy to begin a new, life-changing project with a newborn, which is a life-changing project in itself? I think it was just that I had so many parenting thoughts and experiences flying through my head that blogging about it was a release rather than a burden. Secondly, clearly I was a know-it-all even then. But I think it's good to point out to any of you starting a blog when your baby's wee that you don't have to be a long-time parent to talk about parenting. Your voice is valid, no matter how long you've been on the job. And now I have a three-year-old! And a three-year-old blog! Woo-hoo! A big thanks and a virtual hug to my readers who've brought me such joy and community. When I started blogging, I had no idea that would be the most precious part of writing out my ideas online. It's been marvelous to connect with so many thoughtful, natural-minded, open-hearted parents (as well as non-parents who appreciate such things! ), and I look forward to many more years of enjoying your company as we tramp along this road together. Ok, party's over. On to the links. "Let the Little Children Come" from Momopoly: Compilation of Kate's insightful and respectful articles on bringing kids to a worship service. Sam and I had been experimenting with a home church that incorporates children into the experience, so I'll have to write about that once I get my thoughts together. "…I highly disapprove of shows like TLC’s A Baby Story and the like that over-dramatize childbirth and turn it into a prime-time TV offering! Such shows convey the idea that childbirth is frightening, life-threatening and will most likely end in an emergency situation of some sort. No wonder women are so fearful of giving birth! Can you imagine if we treated other rites of passage in this way? If we had previews for shows like 'Kindergarten Katastrophe' that announced: 'When Michael heads out the door for his first day of school he’s all smiles but when he can’t find his classroom and the teacher hates him, will he be able to get through the day?' And then had 5 year-olds watch them all summer?" "Ten Things To Do While Breastfeeding" from KellyNaturally.com: I once read breastfeeding "advice" that said never to multitask while nursing but to devote your full energy to your baby at all times. I almost choked. I would not be breastfeeding past three-years-old if I hadn't embraced all the possibilities of nursing-friendly activities. "Car Seat Safety" from Musings of a Milk Maker: I'm a staunch advocate of extended rear facing for babies and toddlers. (My three-year-old is still rear facing, once we found a car seat that could accommodate him!) So this ode to five-point harnesses for older kids' boosters is something I can totally relate to. "Baby Names in the Digital Age" by Jen Genova on Babble: I thought this was an interesting take on the modern consequences of naming children. I've definitely thought about the domain-name issue, but I hadn't considered the privacy vs. searchability aspect. Frankly, though, Sam's last name is so uncommon there's really no way a child with his last name could hide. It is me! From "Arbitrary discipline," when Mikko was only eight months old. like something a serial killer helped me with. His response, in direct message? "I'd have to double-check, but I'm pretty sure it was. Lovely sentiment, succinctly expressed." 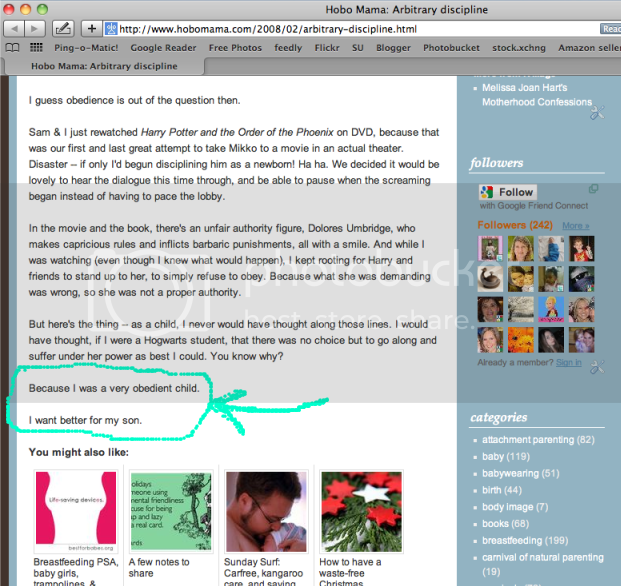 Oh, no, Alfie Kohn, author of one of my favoritest parenting books evah, did not just say I wrote something awesome! He did? He really did? Grab the smelling salts. P.S. I know I'm a dork. P.P.S. Look how many retweets my quote got — too bad it wasn't linked to me, hey? You can't have everything. P.P.P.S. Alfie Kohn's going to think I'm stalking him now and avoid ever quoting me again. P.P.P.P.S. But it was worth it. Check out Authentic Parenting, Baby Dust Diaries (although I think she's taking a twin-pregnancy-induced hiatus, so go give her some love), Maman A Droit, Navelgazing, and pocket.buddha for more Sunday Surfing! Let me know if you also Sunday Surf or do a similar link love post each week, and I'll link you up. 1st - I'm honored that you mentioned me & my post. Thank you! 2nd - I'm double honored because I'm mentioned in the same post as Alfie Kohn, who responded back to you on Twitter? You are so cool. 3rd - Happy Blogiversary Lady!! 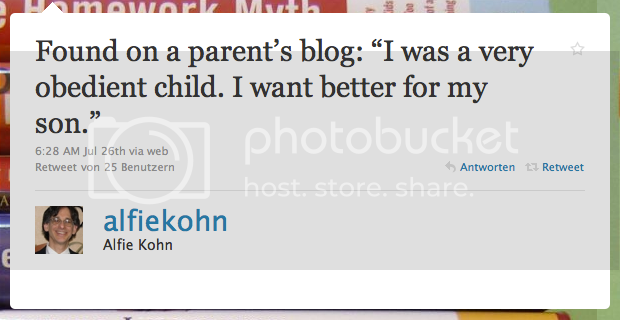 That is so cool about Alfie Kohn quoting your blog. And that is an amazing quote that I can totally relate to. I don't think you're being a dork at all. But maybe it's just that I'm a dork too. Hmm. I have been meaning to tell you that my Libre tea glass arrived and it is awesome! It looks even prettier in person than in the pictures and works great. Thanks! Happy Blogiversary! You're totally right that brand-new parents have just as much to write about parenting as more experienced ones. Parenting is totally a process, and everyone is learning and having real, valid experiences as they go along. Happy Blogoversary!! I love the "then" "now" pix of you two. Congrats on both the blogiversary and the quote! O.M.G! That is NOT a small thing... that is a huge deal! You have every right to be excited and proud! But dang... he really should have linked! Wonder how many people will quote HIM as saying that now? Aw yeah! I made it in to your Sunday Surf! Woo Hoo! That tweet from Alfie Kohn is so very cool. And it's a great quote. Alfie Kohn reads your blog! It is an awesome quote. It should be your tagline.